Women`s multi harnesses the energising power of real fruits and vegetables delivering essential vitamins and minerals, organically. 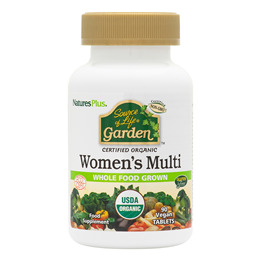 This multi has over 35 different organic wholefoods including cranberry, flax, maca and fenugreek. Kelp, Guava, Holy Basil, Lemon, Mustard, Amla, Moringa, Annatt, Sesbania, Apple, Orange, Concord Grape, Blueberry, Strawberry, Cranberry, Beet Juice, Blackberry, Black Currant, Cherry, Pomegranate, Raspberry, Carrot Juice, Bell Pepper Red, Cucumber, Sweet Potato, Broccoli, Spinach, Mango, Papaya, Wild Bilberry, Cinnamon. As a food supplement for adults, take 3 tablets once daily. This product contains iron, which, if taken in excess, may be harmful to young children. 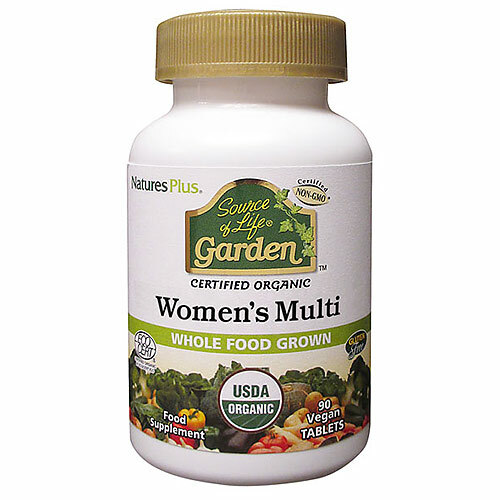 Below are reviews of Source of Life Garden Organic Women`s Multi - 90 Tablets by bodykind customers. If you have tried this product we'd love to hear what you think so please leave a review. Women`s multi harnesses the energising power of real fruits and vegetables delivering essential vitamins and minerals, organically.